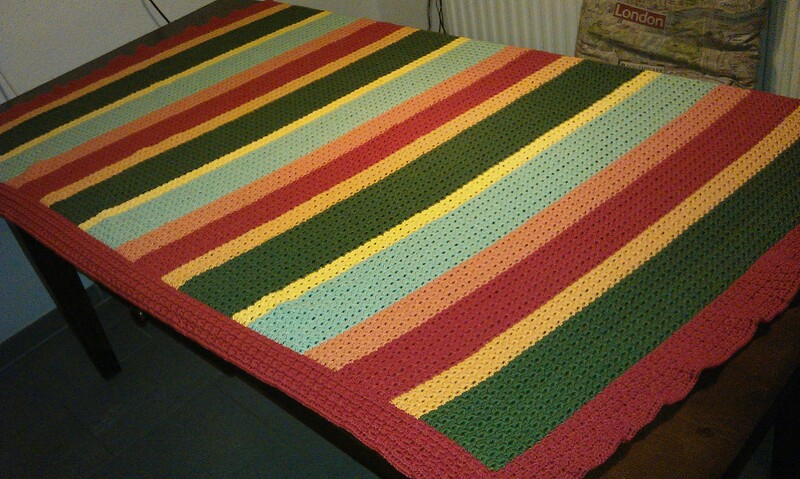 Guess what: I finally finished my big crochet blanket, the biggest and heaviest thing I’ve ever made in my crochet career! I really wanted to open this blog post with this sentence. I have worked since March on this blanket and finally I’m done! I did four double rows of stars all around the blanket and another one of single crochet to finish it and I think it is absolutely great. It is over 1m wide and about 1.70m long which means it is quite heavy. Now it only needs blocking because the edge is a bit ripply. And because on Saturday I was really sick of crocheting stitch after stitch on the blanket I threw in a quick side project. Some weeks ago I could stop myself from placing an order for Drops Yarns. As I couldn’t decide which ones to take (quality as well as colourwise) I did a kind of sample order, ordering different yarns and colours. Now I’m working my way through them. I had planned the Alpaca yarns maybe for a sweater but they are too fluffy for my taste, yet super soft . So I looked for a pattern that uses only one skein and I found the Hermione Hearts Ron hat and started one in the demin/green colour way which is absolutely lovely. 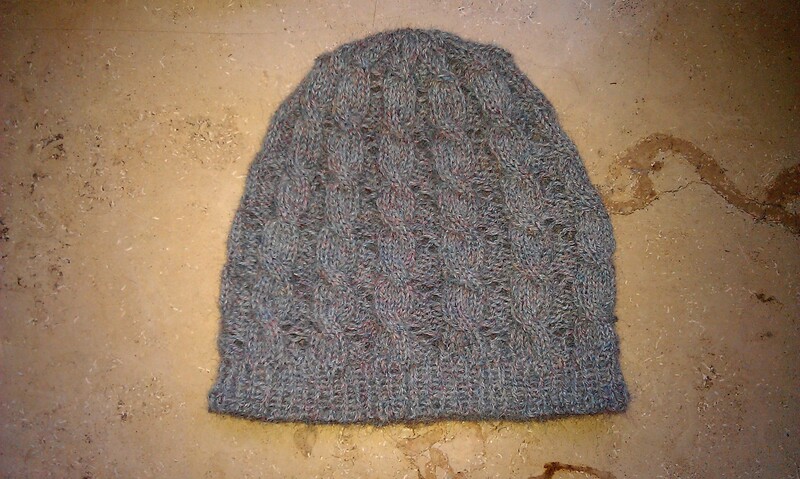 But even so I added another repeat of the pattern in length before decreasing the hat is more child size than for my really not that big head. But I don’t mind. 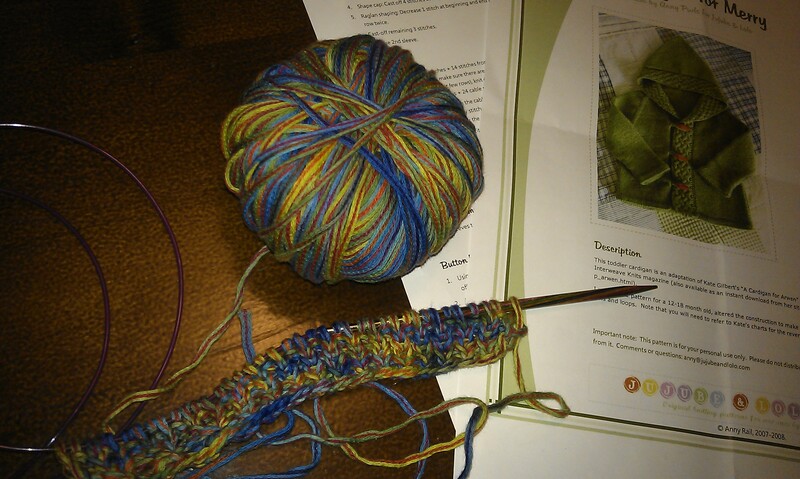 The colour was lovely but I think the green/turquoise is lovely too and I might simply make another hat in that colour adding 11 stitches (one pattern repeat) and another pattern repeat in length (hope the skein is enough for that…). And the small hat goes into my charity box. By the way the other sample yarns are Drops Alaska in mustard which has a really cool colour but it is not very soft, neither is the perfect teal Lima Wool. Baby Merino in dark grey is super soft and nice and I might order some more as soon as I know what to do with it. The same goes for the Big Merino in orange and the Merino Extra Fine Yarns in Browns and Green. I might turn them into a scarf for Michael or order some more for a sweater. Oh and you might have noticed but I finally finished my pattern for the Katniss Cowl. I am so excited. I hope that some people will try to make it too and I hope they like and understand my pattern. It is a very easy thing to knit. Really. It just might look a bit scary because of the charts. But it really knits up fast! I finished Katniss Cowl No. 2 quickly on sunday and already took pictures to make a photo tutorial on how to make the roped collar piece. I just have to work them together into a blog post. So now I’m ready to start reconsider my knitting for christmas list and make some projects before I start with something big again. I actually went yarn shopping in my lunch break to look for yarn for a toddler cardigan. 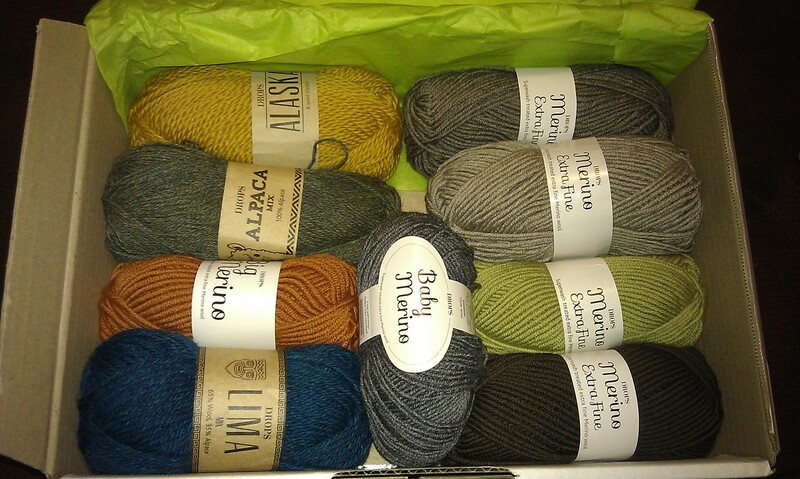 As usual I bought only one skein to check out which yarn would be best for the cardigan. I bought a cheap one to try out which I haven’t even touched yet because SMC Select Solavita is so super lovely. And I later found it on the internet for half the price I paid in store this noon. As I already chose to do the toddler cardigan with it I will order the missing skeins here. 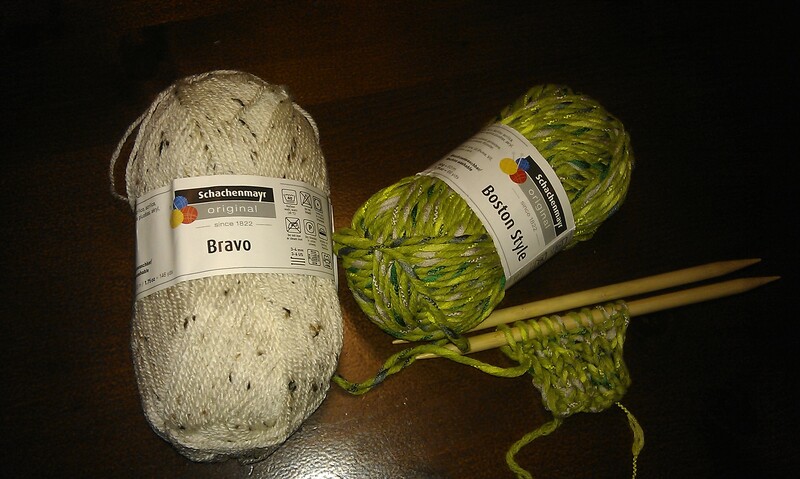 And I got myself a skein of Schachmayr Boston Style in citrus color because I thought I really would love to make a hat using this as accent colour. Lets see what grey I can best mix it with because in this combination I’m sure it will look great with my textured shawl. After another online research I now know that it was actually Schachenmayrs Lova that had caught my eye some weeks ago but hey, can’t one have more than one hat? To finish this post up and link to Ginny’s Yarn Along what am I reading? Well I finished Jo Nesbo’s The Bat and am off to no. 2 “Cockroaches“. I’m very sad that in contrary to what I wrote about book no. 1 last week, the main character has moved from “Scandinavian crime story character with an ex-problem to character with the usual Scandinavian crime story problem set” yet I feel for detective Harry Hole and want to slap him in the face to make him change his life. I’m not very deep into book no. 2 yet so lets see what might happen. Maybe some one there gets him back to kind of normal again. We’ll see. This said you see that I’m really absorbed in the book. I like when books do that even if the story doesn’t turn out the way I want it to turn out. Other than that I’ve been reading Isabel Allende’s “The house of Spirits” for the last weeks. A chapter at a time. This is a Southern American classic that I’ve read many years ago as a teenager and as I didn’t remember much and as I now feel didn’t understand everything back then, I enjoy reading it again. 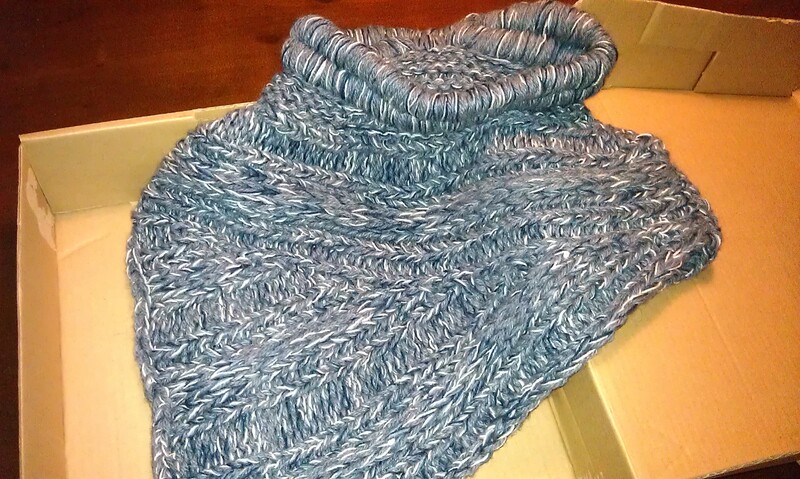 This entry was posted in Knitting & Crocheting and tagged Blanket, Cardigan, Crochet, Hunger games cowl quest, Katniss, Knitting, Yarn Along by kathatravelling. Bookmark the permalink. Congrats on finishing the crochet blanket! It must be a relief to have it done. For blankets I’ve made in the past, it was fun to work on, but I was usually happy to see them finished. And I’m happy to see you have the Hunger Games Cowl pattern up and ready! I’ll add that to my list of Ravelry patterns to peruse. (I also love any mention at all of Harry Potter, so just the name “Hermione Hearts Ron hat” was enough to excite me.) The small hat looks great, I’m sure it’s big brother will be great in green.